Grandparent's Day in Queensland is celebrated on the first Sunday in November, an opportunity to highlight grandparents and recognise their valued role in supporting and encouraging families. It's been said that 'to a child, the perfect granddad is unafraid of big dogs and fierce storms but is absolutely terrified of the word, Boo!' But there are other creative ways to be a terrific grandparent- ideas that are loads of fun but won't break your budget. 1. Cook a recipe together. It can be as simple as pancakes or scones with jam and cream but kids love to be involved in the kitchen. If you're not a confident cook, take a look at some of the recipe books by Annabel Karmel. Her recipe creations for kids are simple and lots of fun: Bagel Snakes, Sausage Hedgehog, Jelly Boat and more. Check out her website or download the app and start cooking. 2. Learn something new together. Make some memories with your grandkids as you work together on a new project. If you're lacking ideas, check out 5min.com, a website with thousands of 5 minute how-to videos. Another idea source is Australian Geographic store (also online) where you will find out how much fun science can be: construct a yacht compass, create a magnetic sculpture, build a bird feeder or observe the world of ants with an ant jungle. 3. Visit a park with your grandchildren. It sounds simple, but it's one of the outings that kids regularly list as fun places to go with grandparents. And, the Gold Coast has some really special parks. Search their online parks-finder. 4. Make a memory bag or box. Choose an attractive bag or box and fill it with interesting memorabilia (concert tickets, old photos, timetables, postcards) or interesting little gadgets you may come across. Whenever the grandkids need a distraction or to fill in some time, bring out your special Memory Bag. 5. Share your story. Kids love a story, whether it comes from a book or it's your own. Open up a conversation with your grandchildren by asking questions and sharing something about yourself. Use a list of Conversation Starters to get you going: if you were a superhero what superpower would you like? What would be a good flavour for toothpaste? 7. Treasure Hunt. Hide some small treasures and give the kids a map to find them. Make it harder for the older ones by devising cryptic clues and you'll have them happily busy for hours. 8. Ice-cream for breakfast. 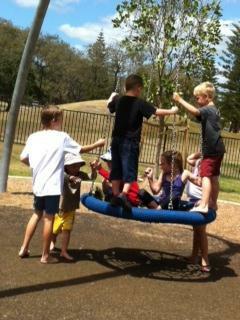 One of the wonderful things about being a grandparent is doing spontaneous, unexpected things with your grandkids. Think outside the box. Have ice-cream for breakfast, visit the playground early evening, teach them to skim pebbles at the beach. 9. Blow bubbles. What is it with bubbles? Everyone loves them. Whether you keep a small bottle of bubble blowing mix handy or invest in some of the super-sized bubble wands, it's sure to please. There are even some bubble products that stick to your finger... what fun! 10. Artistic fun. Research has shown that, not only is painting a lot of fun, it has great therapeutic value. Give kids a box of paint or some crayons and ask them to draw your portrait while you do one for them. If you don't like the mess of paints, download a painting app. Share some fun with art. Little things done consistently and lovingly will build a great relationship. So are you ready for adventure? Together with your grandchild you can build connection and share simple but creative activities that produce lasting memories. You have a grandparents' day? Cool. This article reminds me of the weekends I used to spend with my grandma. We would go to the park and play crazy golf, or go shopping and have a McDonald's Happy Meal. If the weather was bad, we would stay at home and draw or play board games. I think it's great you have a day dedicated to them.